Boat Wax: Myth busting this confusing topic! When it comes to finding the best boat wax, we as consumers are forever at the mercy of slick marketing and advertising. While I know of many people who simply use car care products to care for their boats, the question still remains as to whether there is a significant difference between boat and car waxes. People often ask me professional if they should really be using one of the many products labeled as marine grade wax or a dedicated wax for boats. Not only have we been buried as consumers with endless choices when it comes to the best in car waxes and car polish, but the same frustration and confusion exist among boat owners simply looking for products that work. Follow along as I break this topic down into basic steps of information and lay the foundation as to what you need to know when it comes to finding the best protection for your boat. "Darren, I know my boat needs to be waxed, but I am confused by all the many products. 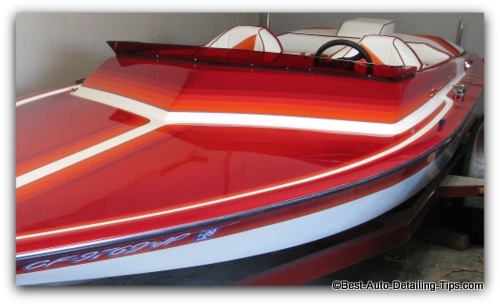 Is it really necessary to find the best boat wax or will car waxes work?" I believe that educated people make better consumers. Unfortunately the Internet is filled with endless boat wax reviews all aimed at simply separating you from your money. I also believe the best place to start is at the beginning, and that the more you understand, the further you can go. So let's start with the basics and build from there. "Darren, can I use my car wax on my boat?" The simple answer is YES! When it comes to protecting and the visual enhancement of your boat, any wax that can be used on your car can also be used on your boat. But with that said, this is still an answer to an oversimplified question that is much more complex than figuring out which wax is best for your boat. "Tell me more about this being an oversimplified question." Most people naturally associate car care with boat care. They both need protection, and boat owners just like car owners also want their boats to look as good as possible. The problem is that gelcoat (the top layer of material used in making boats) is not the same as clear coat (the top layer used on cars in the 2-stage paint process). "So what about this gelcoat and what do I need to know?" Gelcoat is a very porous material. It is strong and durable, but oxidizes very easily when exposed to the elements. Car's have clear coats that are an invisible layer of protection for the color base coat. Boats do not have clear coat and therefore oxidize much more quickly and differently than the clear coat on cars. For this reason, virtually every boat will have some degree of oxidation to it; even a boat that still looks shiny will have oxidation to it. 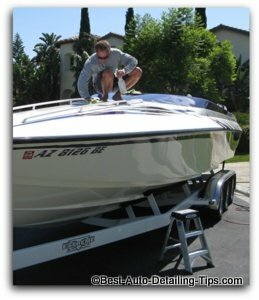 Most people do not understand the nature of gelcoat and assume that if their boat still has some shine to it, they can simply apply some form of wax or sealant. Because gelcoat is so porous and oxidizes so easily, trying to put a wax or sealant directly onto a boat with oxidation, becomes very problematic. So ideally it would be necessary to use some form of polish to remove the oxidation first, then follow with your choice in a boat wax or sealant. If you want to see what I recommend when it comes to polishing your boat for professional results, you can go to my boat buffer page and shop amongst the various professional duty boat polishers. "My boat still has some shine to it, how can I tell if there is any oxidation to it." Simple; there are a couple ways to determine if you can simply wax your boat as is, or if you need to shop for a boat polish, or a boat cleaner wax. Find the area of your boat that looks the worst; usually somewhere along the top surfaces. Apply any car wax you may have around the garage. If you can apply and remove easily then you are in luck and can shop for the best boat wax. If you have difficulty at all removing the wax, then you most likely have some oxidation going on. You can also use some white tooth paste (the old-school kind with some grit to it) and rub into your gelcoat in an inconspicuous area and see if the area shines up. If the area is shinier after wipping the tooth paste off, then you will see that your boat is in need of some cleaning and polishing. "Darren, I have seen products labeled as synthetic sealants for boats, what can you tell us about these synthetic boat sealants?" Much! Every where in life there is a general progression from natural to synthetic; From motor oils to food products. As technology continues, it seems that synthetics will offer the winning combination of benefits over their natural counterparts...as a general rule anyways. While many products are actually a combination of both natural based carnauba wax and synthetic ingredients, the rule is that natural based products are usually labeled as wax, while products made using synthetic ingredients will usually be labeled as sealants. While sealants seem to suggest a more durable product, the reality is that this is still debate able and you will hear endless debate as to whether this is true or not. When it comes to gelcoat and boats, I personally and professionally believe that synthetics do indeed offer better durability and protection due to the porous nature of gelcoat. But do not come to a false sense of security by choosing a sealant and think that it is literately going to "seal" your car or boat with some kind of invisible layer of protection that is impervious any to any form of assault. Simply put, sealants are made using synthetic ingredients, waxes are formulated with a base ingredient of carnauba and other natural forms of wax. "It sounds like you prefer a boat sealant over a boat wax?" Yes. Like I said, due to the nature of gelcoat and the fact that it is so porous, I believe that synthetic sealants will offer the best in protection and durability. For my complete selection of the top rated boat waxes and boat sealants, you can see my best boat wax page. Your boat does need to be protected. Any car wax product as a rule can be used on your boat so long as there is no degree of oxidation. Wax products are made using natural wax ingredients like carnauba. Sealants are made using synthetic ingredients. Most boats will have some form of oxidation. I professional think synthetic sealants will provide better durability and protection. 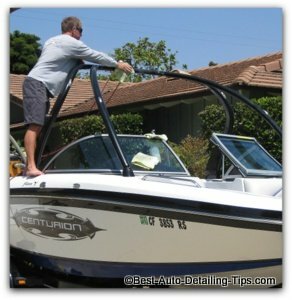 As a rule, if your boat is stored outside it will need either a cleaner wax or a dedicated polish first. Gelcoat is a very tough and durable material. Much more aggressive techniques can and should be used if you are making a comparison to working on your car. My hope is that you have become far more informed than before you found this page! I hope I have succeeded!